July 18, 2018 - Congratulations to Greensboro attorney and Municipal Court Judge Terry N. Massey on his appointment as a Superior Court Judge in the Ocmulgeee Judicial Circuit. Judge Massey will fill the vacancy created by the appointment of Judge E. Trent Brown to the Georgia Court of Appeals and his office will be located in Milledgeville. For more details on the story and further background on Judge Massey click here. July 2, 2018 - Congratulations to Chief Judge Donald W. Gillis of the Dublin Judicial Circuit on his unanimous election to a second 2 year term as District Administrative Judge. Judge Gillis will continue to serve on the Judicial Council of Georgia in his term that began on July 1, 2018. May 10, 2018 - Congratulations to Ocmulgee Circuit Judge E. Trenton "Trent" Brown on his appointment by Governor Deal to the Georgia Court of Appeals. Judge Brown will replace Judge Tripp Self who was appointed and confirmed to the U.S. District Court for the Middle District of Georgia. Please see Governor Deal's press release here. December 21, 2017 - Congratulations to Vidalia Attorney Howard C. Kaufold, Jr. on his appointment as a Superior Court Judge in the Oconee Judicial Circuit. Judge Kaufold will fill the vacancy created by the retirement of Chief Judge H. Frederick Mullis, Jr. and his office will be located in Eastman. For more details on the story and further background on Judge Kaufold click here. July 2, 2016 - Congratulations to Judge Donald W. Gillis of the Dublin Judicial Circuit who has been elected by the judges of the district council to serve as the District Administrative Judge. As part of his responsibilities Judge Gillis will serve on the Judicial Council of Georgia, which is the state-level judicial agency charged with developing policies for administering and improving all levels of courts in the state. Judge Gillis will serve a two year term that began on July 1, 2016. May 25, 2016 - Congratulations to Milledgeville Attorney Amanda S. Petty on her election to the Superior Court Judgeship in the Ocmulgee Judicial Circuit. Judge Petty will fill the vacancy created by the retirement of Judge Hugh V. Wingfield III and her office will be located in Gray. For more details on the story and further background on Judge Petty click here. May 1, 2016 - Congratulations to Middle Circuit Chief and District Administrative Judge Kathy S. Palmer on her election as Secretary-Treasurer of the Council Of Superior Court Judges. Judge Palmer's four year term of service begins on May 1, 2016 and will lead her to the Presidency of the Council. For more details on Judge Palmer's election click here. December 30, 2014 - Congratulations to Madison Attorney Brenda Trammell and Ocmulgee Circuit Assistant District Attorney Alison Burleson on their appointments to the Superior Court Bench in the Ocmulgee Judicial Circuit. Judge Trammell will fill the vacancy created by the retirement of Judge Hulane E. George, who will be taking Senior Judge status. Judge Trammell's office will be located in Milledgeville. Judge Burleson will be filling the vacancy created by the death of Judge James L Cline, Jr. and will be located in Monticello. For more information click here. July 2, 2014 - Congratulations to Chief Judge Kathy S. Palmer of the Middle Judicial Circuit on her unanimous election to a second 2 year term as District Administrative Judge. Judge Palmer will continue to serve on the Judicial Council of Georgia in her term that began on July 1, 2014. December 9, 2013 - Congratulations to Eastman attorney C. Michael Johnson on his appointment by Governor Deal to the Superior Court Bench in the Oconee Judicial Circuit. Judge Johnson will fill a newly created position giving the six county circuit a third Superior Court judgeship. Judge Johnson will be sworn in on January 14, 2014 and his office will be located in Eastman. For more information click here. August 24, 2012 - Congratulations to Putnam County State Court Judge E. Trenton Brown on his appointment by Governor Nathan Deal to the Superior Court bench in the Ocmulgee Circuit. Judge Brown will fill the vacancy created by the resignation of Judge John Lee Parrott and his office will be located in Monticello. For more details on the story and further background on Judge Brown click here. July 2, 2012 - Congratulations to Chief Judge Kathy S. Palmer of the Middle Judicial Circuit who has been elected by the judges of the district council to serve as the District Administrative Judge. As part of her responsibilities Judge Palmer will serve on the Judicial Council of Georgia, which is the state-level judicial agency charged with developing policies for administering and improving all levels of courts in the state. Judge Palmer will serve a two year term that began on July 1, 2012. December 16, 2011 - Congratulations to Jon F. Helton of Dublin who was appointed to the Superior Court bench by Governor Nathan Deal. Judge Helton will be filling the Judgeship formerly held by Judge J. Stanley Smith, Jr. who recently retired to enter private practice. For more details on the story and further background on Judge Helton click here. November 29, 2011 - Congratulations to Judge Stan Smith of the Dublin Circuit who has retired from the bench. 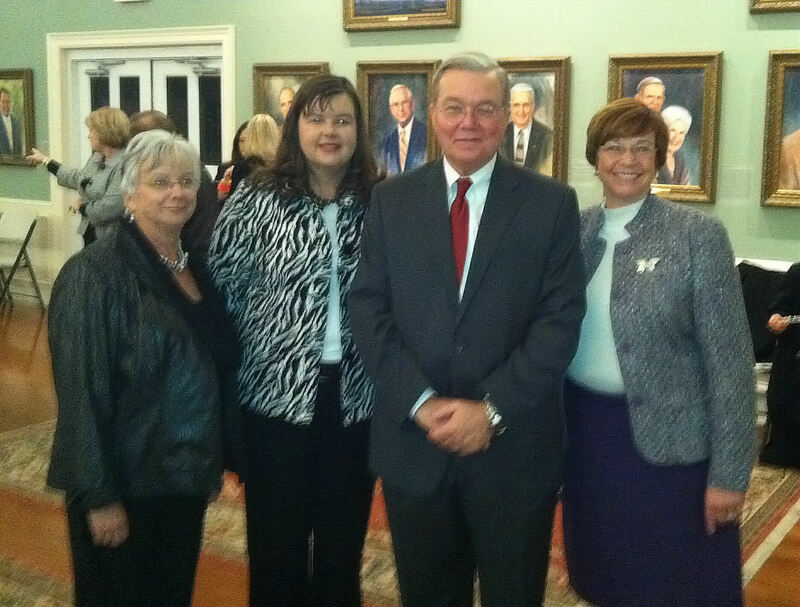 The photo below is from Judge Smith's retirement reception. In the picture are Jeannine Lloyd, Julie Garrett, Judge Smith, and Elizabeth Couey. Good luck to Judge Smith as he leaves the bench and enters private practice after many years of public service. October 27,2011 - Chief Judge Kathy Palmer of the Middle Judicial Circuit recently made headlines for allowing an adoption to take place using the SKYPE video-conferencing technology. The adopting father is a civilian contractor serving in Afghanistan. For more information please read the newstory here. May 21,2010 - Congratulations to Judge Bobby Chasteen, who was recently designated to serve in place of Chief Justice Carol Hunstein and hear an appeal to the Georgia Supreme Court. To read the Supreme Court of Georgia Press release, click here. 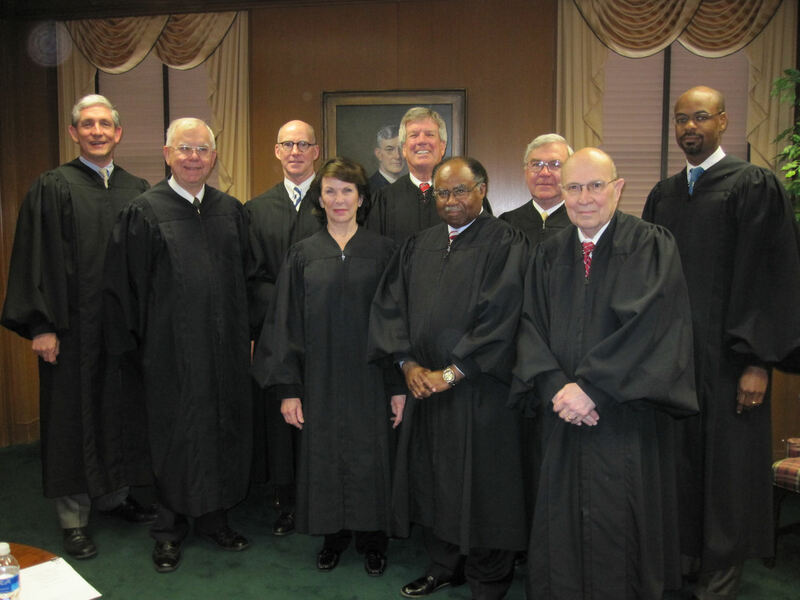 To see a picture of Judge Chasteen with the Georgia Supreme Court justices, click here. January 20, 2010 - Congratulations to Chief Judge H. Frederick Mullis, Jr. of the Oconee Judicial Circuit on his election as the new Administrative Judge of the Eighth District. Judge Mullis was elected by his fellow Judges at their winter meeting, and will succeed current Administrative Judge J. Stanley Smith when his term expires on June 30, 2010. September 11, 2009 - Congratulations to some new grandparents in the Eighth District! Marsha Riner, Administrative Assistant to Chief Judge Kathy Palmer in the Middle Circuit, has a new granddaughter that was born on September 9. 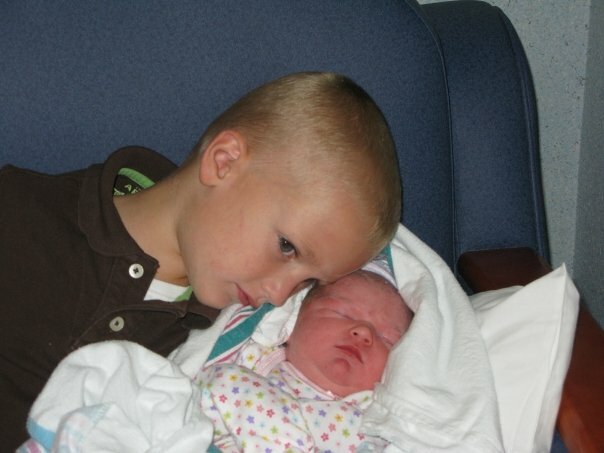 Paige Ellen was 9 lbs, 1 oz and can be seen with her big brother River by clicking on the link here. Judi Boatright, Administrative Assistant to Judge Bobby Reeves in the Middle Circuit, has a new grandson who was also born born on September 9. Brock Ray was 6 lbs, 9oz, and his picture will be updated when Grandma puts him down and returns to work! 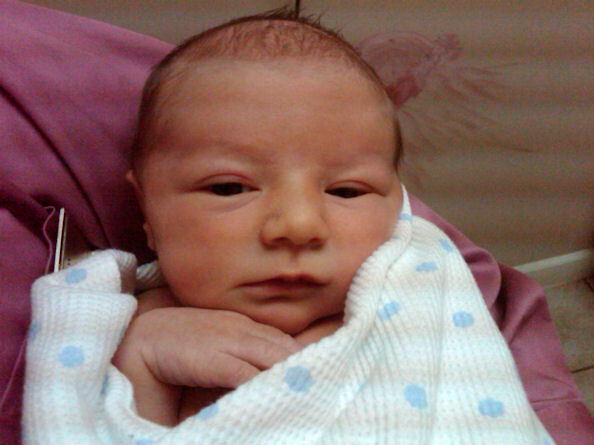 Bob Nadekow, District Court Administrator, has a new grandson born on August 21. Patrick Riley was 6 lbs, 14 oz and can be seen here. Courthouse in Hawkinsville. Judge Wall's contact information may be found here.